Home > Dining and Gourmet > Beverages > KOI: Pay only $2.50 for M-Sized Cup of Bubble Milk Tea using GrabPay! From 7 May 2018 KOI: Pay only $2.50 for M-Sized Cup of Bubble Milk Tea using GrabPay! Use GrabPay to enjoy an M-sized cup of Bubble Milk Tea at KOI for just $2.50! While stocks last, so redeem it today! 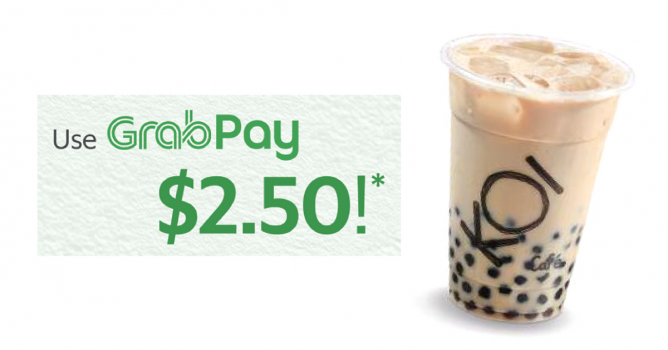 Promotion: Use GrabPay to enjoy an M-sized cup of Bubble Milk Tea at KOI for just $2.50! Validity: From 7 May 2018, while stock lasts. Valid only for Bubble Milk Tea, Bubble Green Milk Tea and Bubble Oolong Milk Tea. Limited to 1 cup per transaction and 2 redemption per user. This promotion is not available for upsizing or addition of other toppings. This promotion is not valid with other GrabPay promotions.